Like most Japanophiles out there, I like G4TV’s Duty Free TV programs… well everything except the Super Big Product Fun Show. That show reminds me of Spike TV Most Extreme Elimination Challenge (MXC). I have a hard time watching that show… I wish it wasn’t a trend to dub over interesting Japanese shows with the purpose of trying to be funny. But that’s for another post. Ninja Warrior has always been a favorite of mine, and I even did a little tribute to Shingo Yamamoto a few months back that prove to show he has more fans than just me. Out of the entire lineup for Duty Free TV, Unbeatable Banzuke has to be the most unique. The idea is that you have a series of tasks to do that turn out to be crazy stunts. You are timed, and if you win, your name gets added to the Banzuke list. That list honors all the competitors that have bested the Unbeatable Banzuke. The Japanese are very creative with their game shows. 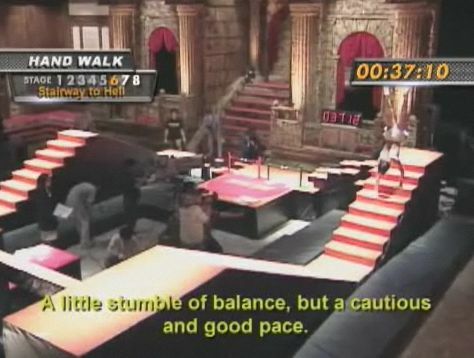 One, out of the dozen or so popular challenges is walking on your hands through a grueling obstacle course complete with mini rivers, hills, and other crazy areas. All of the challenges on Unbeatable Banzuke require thought as well as skill to complete. I wouldn’t be exaggerating to say that almost everyone who tries the challenges will fail. But for those super-human enough to complete their task, their name will be etched in the Unbeatable Banzuke forever. The videos below prove how crazy it can get. G4TV’s Duty Free TV shows at 8:30pm EST weekly.